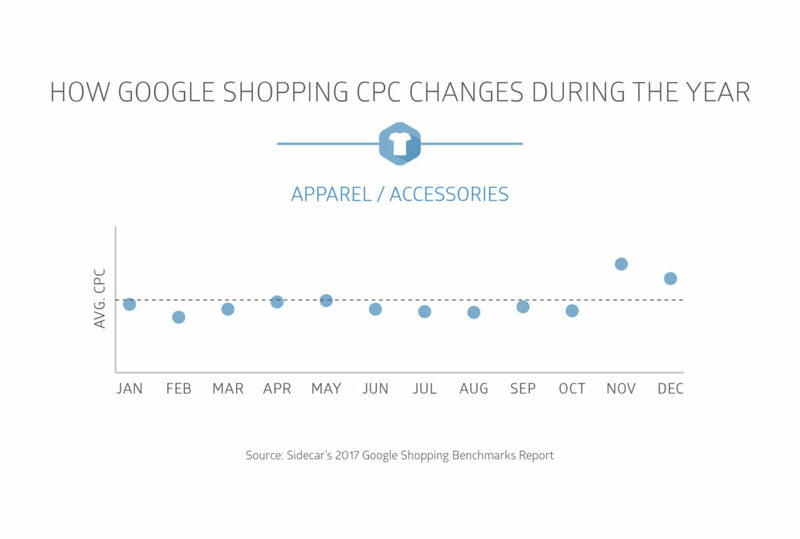 For apparel retailers, competition in Google Shopping has grown especially steep during the holiday season. For starters, CPCs within the apparel vertical jump more than 60% from October to November in 2016, while overall revenue increases average 50% during the holiday season. Efficiency goals typically take a backseat during holiday. Apparel is, after all, the most popular gift of the holiday season. In 2016, more than 60% of shoppers gifted apparel items, according to the NRF. 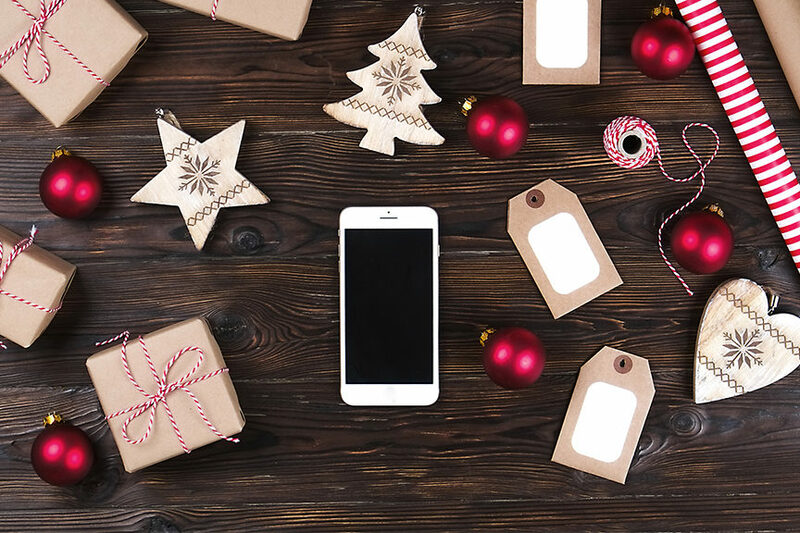 If you’re an apparel retailer looking to assess your holiday plan for Google Shopping and ensure your strategy is tailored to inventory levels, check out these tips you can act on now. All told, CPCs were 57% higher during November and December than the rest of the year. That higher cost can bar your products from competing during peak holiday time. But here’s the thing: While more than 50% of holiday shoppers start to research their purchases in October or earlier, only 33% actually purchase this early in the season, according to the NRF. This means you don’t necessarily need to pay high CPCs to win at Google Shopping during holiday. You can get exposure within the first weeks of November by boosting bids on your top items while CPCs are still lower. Then, focus your ad spend on shoppers who show higher purchase intent during peak holiday shopping time. Once you notice CPCs rising substantially, scale back your bidding on general audiences. While more than 50% of holiday shoppers start to research their purchases in October or earlier, only 33% actually purchase this early in the season. Save your spend for warmer audiences—like those who have visited your site recently or purchased from you before. You can build these more targeted, qualified audience lists for holiday using Google’s remarketing tools: Customer Match and RLSA (Remarketing Lists for Search Ads). You’ll still need to bid aggressively on your Customer Match and RLSA audience segments in November and December. 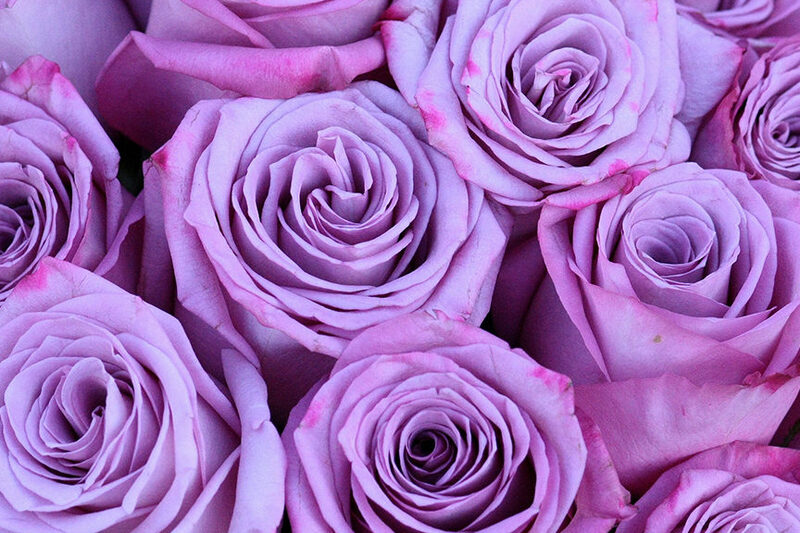 But these audiences—dormant customers and visitors to your site—convert at a far higher rate. Earlier this year, we reviewed the performance of both tools and found they can lead to a 70% increase in conversion rates. This approach has two advantages: First, Google Shopping remains a customer acquisition channel, helping you hit short-term sales goals while building a seasonal shopper base for holiday. Second, it fits naturally with consumer behavior. Shoppers research purchases early in the season but make few holiday purchases before Thanksgiving. 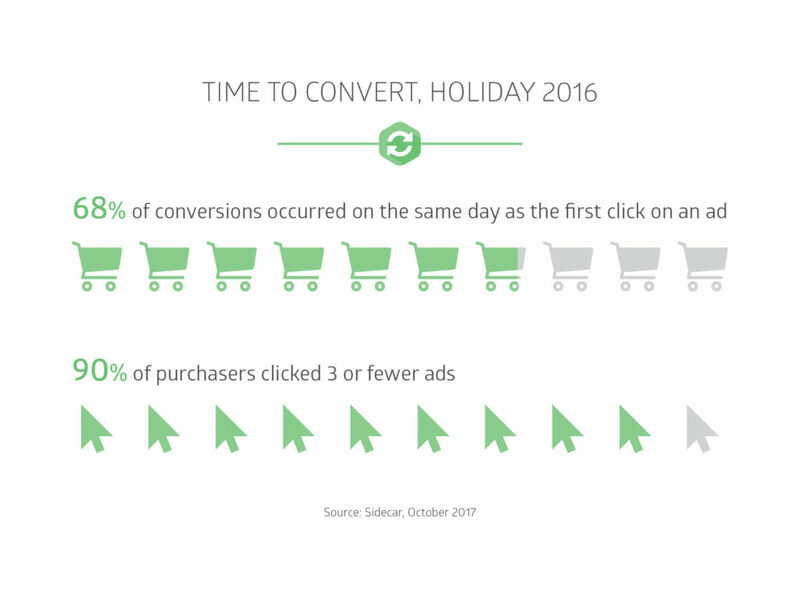 When holiday kicks off in earnest, conversions tend to occur shortly after the first click on an ad. In an analysis of a sample Sidecar customer in the apparel vertical, we found that 68% of conversions occurred on the same day as the first click on an ad, and 90% of purchasers clicked three or fewer ads during holiday. This holiday, be sure to go beyond optimizing Google Shopping campaigns in November and December. Optimize your full-funnel campaigns from October onward. If you’re looking for some fresh ways to slice and dice your holiday audiences, try these segmentation ideas. On the whole, clicks from branded search queries return a 16% higher return on ad spend than clicks from non-branded search queries. But it’s not always that simple. A few brands have become nearly synonymous with certain products—think The North Face and fleece jackets, or Gucci and luxury handbags—to the extent that some branded queries can actually underperform non-branded queries. That’s because consumers are using these branded queries to “window shop,” leaving you with high amounts of unqualified clicks. The trick is finding the branded queries that deliver high-quality, intent-driven Google Shopping clicks. In the case of The North Face, for instance, it may be terms that include “Thermoball,” or another specific collection of jackets from the brand. The trick is finding the branded queries that deliver high-quality, intent-driven Google Shopping clicks. This data is available within AdWords. And though you can’t bid on specific keywords, you can hack keyword targeting by creating multiple campaigns with negative keywords to filter unwanted traffic. 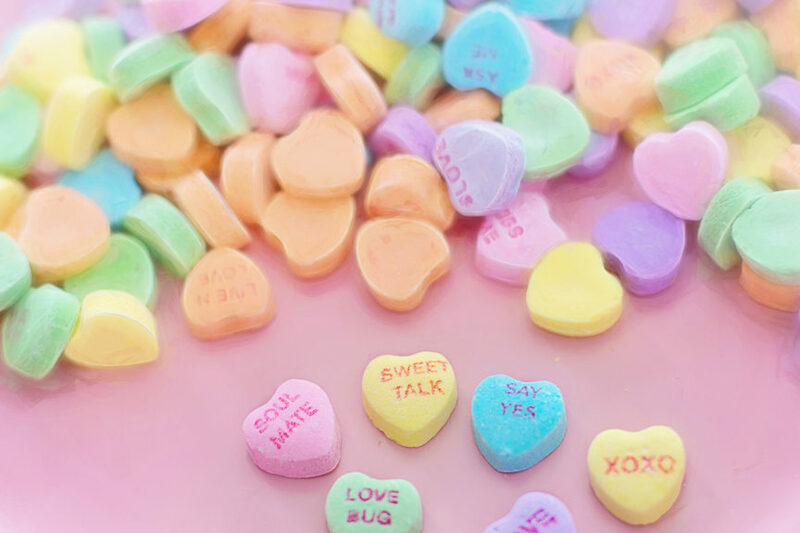 On the whole, branded terms have lower click-through rates, but higher average order value and conversion rates. Budget-conscious retailers will likely want to invest in branded queries that deliver conversions. Brands that already perform strongly with high-intent shoppers (and have some room in the budget) may want to try competing on non-trademarked terms, so they can bring new customers to their product pages. Let’s say it’s Black Friday. If you run out of inventory of a popular women’s winter down coat in black, for instance, you risk running your product out of the Google Shopping ad rotation. Use item group IDs to show the item in other colors and sizes to shoppers in pursuit of that warm winter coat. This can be a costly mistake during holiday: Shoppers are seeking out that specific item, and given the compressed conversion times and higher purchase intent, you could lose out on sales when shoppers set out to purchase the item elsewhere. Don’t worry, it’s a mistake you can avoid. Use item group IDs to show the item in other colors and sizes to shoppers in pursuit of that warm winter coat. While a shopper might prefer the coat in black, perhaps she would consider the coat in charcoal gray if that’s what’s available in stock at the time she’s ready to order. Item group IDs allow you to easily group together variants of a single product with the option to bid differently on them. 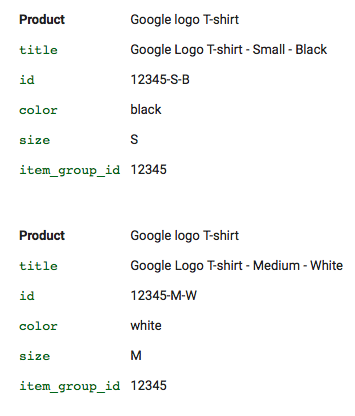 Here’s an example, courtesy of Google, of how you would use variants in different sizes and colors under one item group ID. Because Google ultimately favors one variant over the others, you may want to ensure you’re bidding up on variants of an item so they can take the place of your top performer if inventory runs out. But don’t expect the variant—say, that winter coat in fire-engine red—to rival the top performer. It’s best to allow historical product performance to inform your approach to this tactic. In some cases, you might want to reduce visibility of a particularly unpopular variant if clicks drive up costs without corresponding conversions. When retailers capturing impressions for a product you sell run out of inventory on a specific item, you have the chance to win back impressions from your competition. One of the best ways to spot opportunities is to look for spikes in impression share for a specific item. Even though this requires some trudging through data, an early detection and a quick decision to increase daily budgets can deliver huge wins. If you see a spike in impression share—or a significant dip in benchmark max CPC—you’re in a position to capitalize. To do it, you’ll need to monitor impression share by item group, as well as benchmark max CPC. This will give you a granular view of how often your ad for that popular women’s winter down coat is appearing and how much more competitors are bidding on that same product. If you see that spike in impression share—or a significant dip in benchmark max CPC—you’re in a position to capitalize on the opportunity. Bid up and cash in on the increased demand. This tip will work best for marketers who plan to monitor Google Shopping performance closely and who can be flexible with their daily budget over holiday. One last thing to keep in mind: Impression share data in AdWords is calculated only once daily, so there’s no need to monitor minute by minute. Here’s a reference on how often data is refreshed in AdWords. For many retailers, the holiday season brings a slew of promotions. 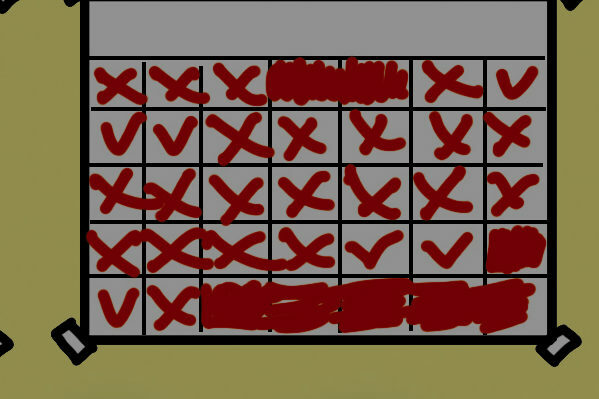 Keeping them all straight and tracking inventory on those items is a common challenge. One way to manage is to use custom labels to group promoted items in your product feed for Google Shopping. Custom labels also allow for increased alignment with overall marketing efforts, without disrupting your core campaigns. Once labeled, it’s easier to spot and group together products on promotion—and adjust bids on those groups. Custom labels also allow for increased alignment with overall marketing efforts, without disrupting your core campaigns. For ideas, check out this handy explainer on 5 custom labels to categorize your Google Shopping MVPs. Google Merchant Promotions can also help tie your promotions together. 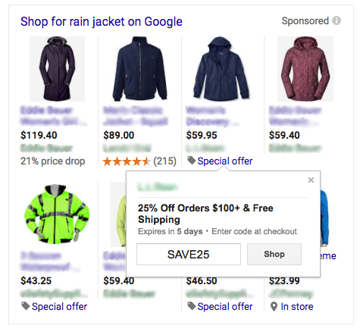 Merchant Promotions are what power those “Special offer” prompts that occasionally appear under Google Shopping ads. When clicked, they reveal discounts or incentives—and they deliver significant performance improvements. We analyzed a sample Sidecar customer who tested Merchant Promotions in Shopping campaigns and found that conversions jumped by 30%, CTR rose by 7%, and cost of sale fell by 10% while the promotion was live. If you haven’t used Google Merchant Promotions previously, it takes only a few steps to get started. Holiday 2017 is on pace to be the biggest year yet for Google Shopping. Apparel retailers who approach holiday with a smart strategy, and a willingness to be flexible at the right times, will be the ones who engineer big wins for their brands.